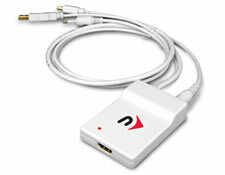 Output both 1080p HD video and digital audio with this all-in-one HDMI adapter. to your HDTV or HDMI Display. on your TV with the use of one adapter. Over 3 feet of cable for versatility in cable management. Bus powered...no AC adapter required. The Mini DisplayPort w/ 5.1 Channel Digital Audio to HDMI Adapter lets you connect a high definition monitor or television, to a Mac Pro (2009), Mac mini (2009), iMac (2009), MacBook, MacBook Pro, and MacBook Air with Mini DisplayPort. Combine Full 1080p HD mini DisplayPort output with 5.1 channel digital audio output from your Mac in a single HDMI connection to your TV or other HD display. Use the Mini DisplayPort w/ 5.1 Channel Digital Audio to HDMI Adapter to connect a high definition monitor or television, that includes a HDMI connector. Review the documentation or check with the manufacturer of your monitor or TV to make sure you're choosing the right adapter. The new MacBook, MacBook Pro, and MacBook Air each have a Mini DisplayPort that allows you to connect an external display or projector using an adapter. You can use an external display as your main workspace or to extend your desktop, or you can work in mirrored mode with a projector so you can view what your audience sees. The Mini DisplayPort USB adapter combines the Mini DisplayPort for video and Apple Mini Jack for 5.1 channel digital audio from your Mac Pro (2009), Mac mini (2009), iMac (2009), MacBook, MacBook Pro, or MacBook Air with Mini DisplayPort. Powered by USB so no external power source is needed. MacBook Pro, or MacBook Air with Mini DisplayPort.